*See in all forms of vision except pigmentation/color (i.e. can't see that someone's skin color or that he’s wearing blue jeans.) Can read through walls via heat/energy conductivity. This enables to read brain activity/heart rate. *Has an ailment where his brain archives everything read or observed. Can recall specifics that he read, heard, saw or encountered. At a very young age he was deemed a genius due to this ailment, as he read and attained several studies from science to physics and psychology. *Elite self-defense. Trained by a discrete corporation as well as had a hobby or reading and exploring others arts to where he's modified a simple and very defensive technique. More to disable and restrain, less to inflict damage. He's quick witted, prone to introduce anything around him to aid against those far beyond his strength or endurance in attempts to evade or escape. *Can increase the static energy of any object (known to him) on several levels. This varies from malfunctioning machinery and body parts, to causing the item to explode. He has since learned a technique where he can cause a concussive blast on contact (can be painful to him so he doesn’t do it often). *Very Low Maintenance, very friendly and helpful. Always inquisitive and reading. Deemed by some as a pushover. Extremely tech savvy (often looked away working on perfecting his "toys"). Also an introvert though, as in he only goes out the house when hes asked to. Orders in most of the time. *He's a tinkerer. Corry bought (the late ) Draxx's old warehouse and is ever expanding it to be a malfunctioning lab/garage that's completely solar-reliable. He spends most of his free time taking something apart, building or inventing. Well versed in hydraulics and automotive science, etc. Weapons: Plasma gun (attained from Paytent in previous match), Shiv Forearm plates (barely uses because of the morbid damage it inflicts), or forearm, shin plates. History: Darius Corry was born with a scarce brain abnormality labeled as "Mnemonia" where he was able to unwillingly comprehend and retain knowledge almost immediately after being exposed to a set situation. This "blessing" enabled him to graduate from high school at age 9. However, instead of continuing to college he was inducted into a discreet organization named the AACA (Advanced American Concentration Association) where he was trained to be the most elite asset to the country’s military. Such investments had their drawbacks being that Darius was way under the age requirement to undergo such harsh conditioning (upon his permission and they supplemented him with "structural reinforcement"). Corry was trained and taught, both mentally and physically among the countries most prestigious yet publicly in-existent soldiers. Plans to birth the youngest and talented soldier went a rye when Darius fell victim to a stray bullet during training. Medical attention of such high precision forced the Association to commit Darius to a public hospital thus revealing their once elusive intentions. The Judicial System then forced a proposition to either release the child with a significant settlement or the Association must be shut down. As a result, Corry was released at age 19, but was never able to neglect his passion for the battlefield. Personality: Darius was deprived socially due to his rapid transition through grade school. So though he's respectful and chivalrous, he lacks to ability to initiate a conversation or survive in social atmosphere (party, group outing, meeting women). His zest for knowledge causes him to be an introvert where he always carrying a book or combing the internet. On the upside, His vast knowledge enables him to give output in any conversation (sometimes too much). He has an extremely high tolerance for other people’s attitudes... pretty much a pushover. However, he's an emotional expert: very compassionate and psychologically intelligent with subtle humor. *Very observant, so is the type to stare. Abilities: *Because of his "gift", he super-ceded the curriculum required for all student of self-defense. As a result, Darius took it upon himself to excel further in several types of martial arts. Thus, he's been to shuffle through several techniques. However, Corry mainly fights defensively (only attacking to disable, disarm or incapacitate) with a quick wit and improvisational advantage (think of Jackie Chan's choreography). He's expounds on things around him if what he wields is not sufficient. *Extremely quick witted, knows what’s combustible, what can carry how much weight, or would be sufficient in certain situations. *His EYES enable him to see in depth (X-ray), Heat and energy...but not in color. This makes him extremely accurate in marksmanship and precise with distance measurement (think daredevil). *He has mastered a near extinct Chinese technique (similar to Qi) that he acquired from reading old literature where he can use his natural ability to conduct static and focus it to one small but condensed burst from his hands that can falter machine or cause them to malfunction(think a mini emp). It takes no time to conduct but can only be carried out by being in contact with the actual electronic device. It is also limited to its span. For example, he can’t shut down a building but could cause the circuits to shut down in a room or even a hall. He can shut down an electric controlled vehicle of a four seater but not a tank (unless in contact with its main power source). **Moo helped Corry reveal a new found ability of manipulating the kinetic energy of any object to the point of explosion (with a couple seconds of concentration) He must be in contact with the object in order for it work. With concentration, Corry can conduct a faint EMP that won’t do anything more than falter or malfunction select machinery. This can only be conducted (via contact) from his hands, but happens almost instantly. Weapons: Wrapped around Darius's forearms and shins, there are several metal plates that he uses for defense against several projectiles (energy and bullets) and often swordplay. They are bonded by a tough, teflon-esque material that's not indestructible but very durable. 2) Remove the dagger for whatever purposes of his choice. 3) Shoot the dagger at a rail gun like force for great distances. Corry grew fascinated with Patent's Handgun in the process of fixing it after blowing its battery during their altercation. As a result, he has kept it in his possession until "he can get it to its initial performance" though quietly he's not looking to returning it. However, in the process of figuring out its dynamics, Darius accidentally learned his ability enables the gun to emit energy in different levels: anything from purely concussive (strong force push without penetrating surfaces) to a near silent, sharp blasts that can pierce through just about any surface. He doesn't leave the house with it unless he knows that he'll need it and would almost never use it to hurt someone, but mainly to disarm or MAYBE disable(blast them away knocking the wind out or skimming the surface of the skin to disarm). Darius's aim is of the highest marksmanship due to his eyesight and training. Corry was severely burned during a confrontation with Suit. Luckily, Corry's Teflon armor protected him from third degree burns on the greater majority of his body. However, he was burned from the neck up as well as his hands. He chooses to keep those areas covered until he feels comfortable revealing it. Clothing: Dress down but not urban (t-shirt or button up rolled to forearms) Legs and arms are never exposed (training scars). Always in *Gold and Navy sneakers*. But nothing to specific just light, neutral colors. 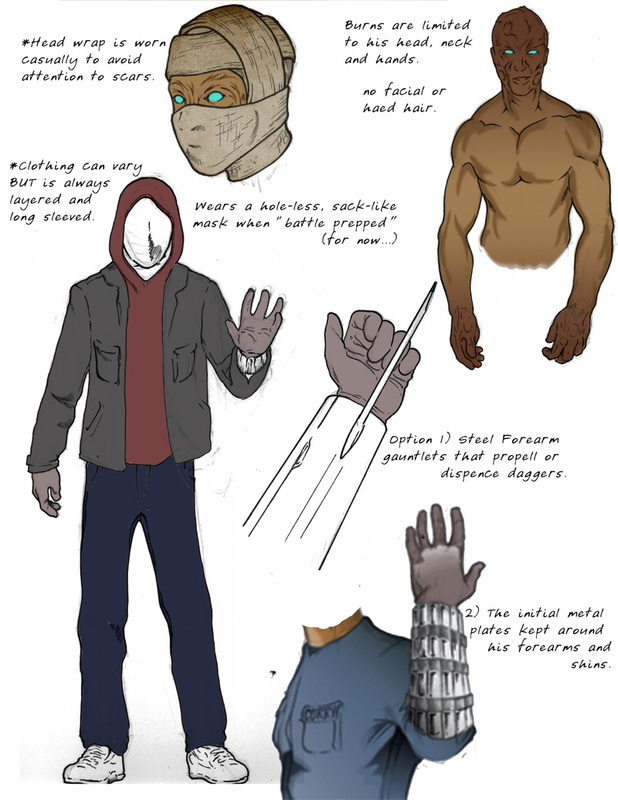 Since his dis-figuration, he dresses in layers and keeps his head and/or face covered. He almost dress in long sleeve everything. His entire head is either completely wrapped (eyes included), covered with a pillow case..or both... since he can see through just about any surface, there's no need for eye holes.